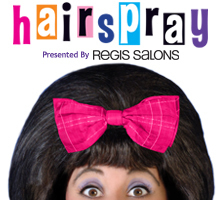 I saw the musical Hairspray at Chanhassen Dinner Theatres yesterday, and I'm still singing and dancing! I've seen the show several times and it's one of my favorite musical theater soundtracks, so it's no surprise that I loved it. It's a great cast of Channhassen regulars and newcomers, and a really wonderful production. I went with my family, a group of 15 people ranging in age from 4 to 66 (including several teenagers), and a good time was had by all. But it's more than just a good time, it's a great message - togetherness, standing up for what you believe in, and the realization that despite the fact that we might look different, we all just want to dance and have fun and be free to live our lives. It's easy to forget that segregation wasn't really that long ago in the history of this country. Today I saw I Wish You Love at Penumbra Theatre (more thoughts on that coming shortly), which gives a much more brutal, realistic view of segregation. Both shows are about using music and television to enact social change, but that's where the similarities end. In real life, segregation didn't end cleanly and easily with everyone dancing happily together. 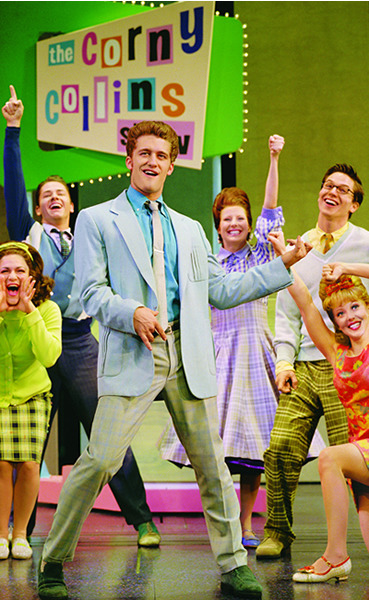 But like Director Michael Brindisi writes in the playbill, Hairspray "is a fairy tale, but it can come true." Humor and music and dancing is a legitimate way of dealing with an important part of our history. Chanhassen newcomer Therese Walth is the star of the show. She plays Tracy with such energy and enthusiasm it's contageous, and her voice is big and beautiful. Her energy is matched by another Chan newcomer, Kaija Pellinen, as Tracy's best friend Penny. She's hilarious and endearing in her awkward lankiness and gum smacking as she follows her best friend and supports her in her adventures. David Anthony Brinkley and Jay Albright may be the best couple I've seen on the Chanhassen stages in some time. Their chemistry is so playful, fun, sweet, and believable, it's a thing of beauty to watch. They have an ad lib section in the middle of "You're Timeless to Me" in the second act. I'm not sure what Jay was doing because his back was to me, but David was cracking up. I don't blame him; I don't know how anyone can look at Jay Albright and keep a straight face, he's such a clown! David usually plays a tall, distinguished, silver-haired gentleman so it was fun to see him play against type as a tall, big-haired, supportive Baltimore mother, and do it so well. Tom Rusterholz as Link Larkin is no Matthew Morrison (who is, really? ), but he puts his Richie Cunningham charm to good use as the boy Tracy falls in love with, and who eventually proves he's worthy of her. Nice to see some new faces in the ensemble along with old faves, including my favorite Chanhassen dancer and perennial teenager Tony Vierling. In any of the big, fabulous dance numbers (choreographed by Tamara Kangas Erickson), my eyes naturally gravitate towards him. Two more Chanhassen faves Julianne Mundale and Janet Hayes Trow play the two less than supportive, but very funny and entertaining, mothers. Kasono Mwanza has the moves as Seaweed, and the voice too. Run and tell that! After I saw the Elvis jukebox musical All Shook Up at the Chan last year, I wrote this: "If Aimee K. Bryant was auditioning for the role of Motormouth Maybelle in next year's Hairspray, she won it in my book!" Apparently it wasn't only in my book, as she is playing the role and doing an amazing job! We had an understudy for Corny Collins, Ben Johnson, and he was excellent. He's everything Corny should be - suave and charming with a beautiful voice (he sings with the Minnesota Opera). Speaking of understudies, I see Kinaundrae Lee is an understudy for the Dynamites, which I would love to see! He played Angel in a local production of RENT last year so I know he can sing and dance in heels! Hairspray has been extended through May so you have plenty of time to make the trip out to the Southwest suburbs to see this colorful production of a super fun show. You'll laugh and dance, and maybe even be reminded that like Tracy, sometimes you need to take a stand to make a difference. It may not end up with everyone happily dancing together, but it might get things moving. Great write up. You impress me as much as the actors impress you.